A cross-party group of MPs will use next month's landmark Brexit vote to try to ensure the UK cannot leave the EU without a deal. They want to amend the "meaningful vote" motion to rule out "no deal". The BBC understands Conservative, Labour, SNP, Liberal Democrat, Plaid Cymru and Green politicians are involved. MPs are due to vote on the prime minister's Brexit agreement with the EU on 11 December. Theresa May has repeatedly said voting the deal down would risk a "no-deal" Brexit. But amendments being discussed in Westminster would seek to rule that out. Several sources told the BBC they think such an amendment is the only one that could command a majority. What happens if MPs reject deal? It would not be legally binding, but a source said if MPs back the amendment it would be a clear "expression of parliamentary opinion". Another source says it would "knock out" leaving the EU without a deal as a realistic option. A third source said there was a "growing consensus" against a "no-deal" Brexit. 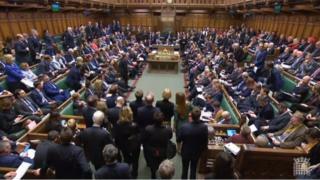 Up to six amendments will be voted on when MPs pass judgement on the prime minister's Brexit deal. One has already been tabled by chairman of the Brexit select committee, Hilary Benn, which would rule out no deal and allow MPs to give the government instruction on how to act. That has been backed by Conservatives Dominic Grieve and Sarah Wollaston, as well as Labour's Meg Hillier, Yvette Cooper and Rachel Reeves. Separately Labour's front bench has tabled an amendment saying that the party cannot support the agreement, as it fails to provide for a customs union and "strong single market" deal. It also says it opposes a no deal withdrawal, and "resolves to pursue every option" that prevents such a scenario. There is also likely to be a front bench amendment from the SNP. Some in Parliament think they are unlikely to pass but they hope a cross-party effort will be seen as less partisan and will have more chance of achieving a majority. The amendments will be selected by Commons Speaker John Bercow, on 11 December - the last of five days of debate on the Brexit agreement.